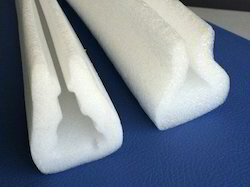 Our range of products include epe foam l profile. • Very good compressive strength compare to other EPE foam sheets. • Very low compression set avoids gap formation over a period of time of packed an article in a corrugated box or wooden case. • Protection For Glass,LED TV EDGE,LCD TV EDGE. • Electrical & Thermal Insulation. • All weather proof . • U-Profile : This self-gripping profile is mainly used for thickness up to 10mm as edge protector, for glasses any antic pieces, sun micas etc. • L-Profile : This profile is mainly used as buffer pads in the packing of electronic Items and any delicate items. A fabricated fitment is also made from this profile.